Is your quality system keeping up with regulatory changes, industry pressures, and the demands of global business? 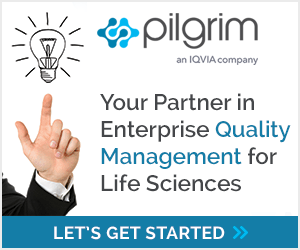 Most quality management software (QMS) solutions on the market today are struggling to meet the rapid pace of change in the Life Sciences industry. Last week, in conjunction with PwC, Pilgrim Quality Solutions presented a webinar on the next generation of QMS. Transitioning to ISO 13485:2016 compliance is the top priority throughout the medical device industry right now. The industry is racing to absorb information on the latest version of the standard. Do you have a plan in place for getting your organization up-and-running with ISO 13485:2016? These resources will help you develop, fine tune, and implement your transition plan. Last week we hosted a webinar titled “Complaint Management Beyond Your Four Walls.” During the webinar, we discussed strategies for ensuring compliance and improving quality by automating complaint handling beyond the four walls of your organization. If you missed the presentation, you can access the on-demand version of the webinar here. In today’s blog, we’ll review some key takeaways from last week’s presentation including topics covered in the Q&A session. Recently, Pilgrim co-sponsored a webinar with LNS Research titled “Supercharge Supplier Quality Management for Competitive Advantage.” During the webinar, Dan Jacobs, LNS Research Analyst, provided many insightful data points from his recent research and made the case for focusing on and advancing supplier quality maturity. The data is clear…and compelling. Almost every organization can achieve significant gains by improving supplier quality management processes and maturity. If you haven’t watched the webinar, you can access it here and see the data for yourself. Like the corrective action process, the change management process is a central part of your quality management system. Change is difficult to manage because it touches every area of your business (including suppliers) because it is constant, and because the process to manage it needs to be compliance-driven. If you already have a change management process in place, here are some resources to help you understand areas where your process can be more harmonized, compliant, and efficient. Tell the whole story about each change. This Q&A on FDA compliant change management provides insight into better managing impact assessment and documentation of a change. These areas are typically weak in most change management processes. The article points out that change documentation is often weak or incomplete because there is an internal assumption that “everyone knows what is going on.” When an auditor or other third party later reviews the change, the record seems incomplete because it doesn’t tell the full story. This can make the process seem less thorough or compliant than it actually is. Recently, we hosted two live demonstrations of SmartSolve Audit Management. The webinar covered a number of topics including how to perform mobile audits, creating audit programs and schedules, working on audits, and managing audit followup. The webinar also included live Q&A during both sessions. Some key themes emerged during both sessions that helped us understand the challenges you may encounter when carrying out quality audits, and how SmartSolve Audit Management can help. Think about your next FDA inspection. How will you feel when the inspection arrives at your facility? Will you be rushed or calm? Flustered or confident? Perhaps more importantly, who will control the direction of the inspection? You… or the inspector? Congratulations! You’re being audited by the FDA! If you’re doing business within the United States, you may find your organization faced with an unannounced FDA audit. But unannounced doesn’t mean that you need to be unprepared or out of control. Let’s take a closer look at ways you can prepare yourself, your team, your site, your quality system, and even the FDA inspector for a successful audit.